For its third edition, MUTEK_IMG presents ‘Mixed Realities’ and settles in the vibrant Mile-End neighborhood for a deep exploration of digital creativity, with free programs concerned with topics as varied as stage and video scenography, wearable technologies, sound spatialization technology and practices, the distribution and sale of digital visual objects and more. At the core of MUTEK_IMG, is the third edition of the professionally oriented VR SALON. Intended for those who seek to create in virtual reality or understand this fast moving medium, it offers a series of comprehensive presentations, case studies, panels, networking activities and a major exhibition of more than 20 virtual reality works. Underlining Montréal’s ascendancy in VR development, it has already become an essential node connecting local, Canadian, American and international participants. Over the course of the last 13 months, all the editions of the VR SALON have mirrored the rapid transformations affecting all aspects of virtual reality creation. Distinguished among the many recent virtual reality events for its professional format, in-depth and up-to-date encounters with the issues, and commitment to practical and artistic engagement, it continues to build on its reputation as an essential destination, spurring lasting encounters between local and international creators and producers. This year’s program dives even further than previous editions with a trajectory of activities over 2 days that cover the entire workflow of virtual reality. The first day begins with the unveiling of results from the Pulse on VR study, led by the Media Lab of the Canadian Film Center and concerned with the virtual reality ecosystem in Canada. The rest of the day will address questions around project ideation, and consequently, funding and distribution: why do a project in VR? what platform(s) to use? how to monetize it? The second day is devoted to VR in practice, from narrative construction, sound and interaction to the various tools for capturing image and CGI creation, and post-production. Finally, the VR SALON resolves at the Moment Factory with the VR (ANTI) Manifesto, developed in collaboration with Doc Circuit Montreal, RIDM festival’s professional market, providing a privileged moment to hear a series of experts question the practices of virtual reality in order to inspire new ways of thinking and activating the medium. More details here. The VR SALON would not be possible without the assistance, collaboration and support of our partners: RPM, Bell, SODEC, the British Council, Culture pour tous, NFB, DCM the professional market of RIDM festival and VR Valley Network. 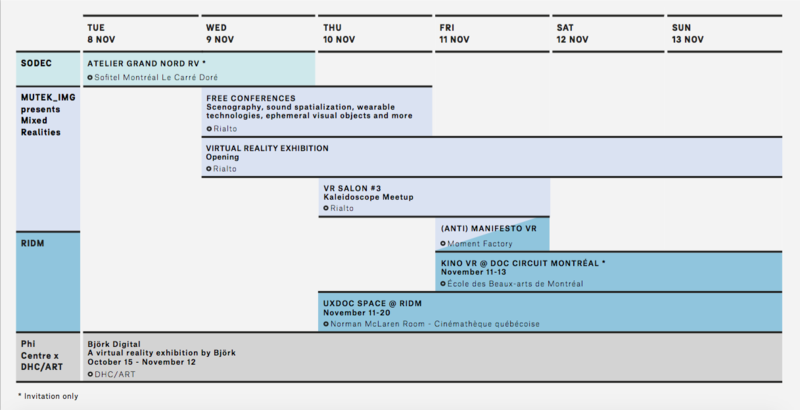 This week of virtual reality events includes the Grand Nord VR masterclass hosted by SODEC that brings together creators from the francophonie, the VR SALON and the KINO VR by Doc Circuit Montreal, RIDM festival’s professional market. Here is the timeline. L’exposition de MUTEK_IMG présentera plus de 20 créations cinématographiques et interactives en réalité virtuelle. Une trentaine de casques seront disponibles et les visiteurs, grands et petits de plus de 12 ans, pourront faire l’expérience d’un visionnement de films en 360 ̊. La plupart des films font partie d’une exposition itinérante, organisée par Kaleidoscope basée à San Francisco. Explore the list of works here (not all pieces listed here will be available in Montreal). More pieces curated by MUTEK to come. The free programming of MUTEK_IMG convenes artists, producers and audiences in the digital arts community and runs parallel to the paid activities of the VR SALON. The various modules offer essential updates on new practices in video scenography, the reimagining of performance and concert space, sound spatialization technologies and virtual musical creation, new platforms for the distribution and sale of audiovisual and new media works, wearable technologies and panels dedicated to critical discourse on the general themes circulating around mixed reality creation.